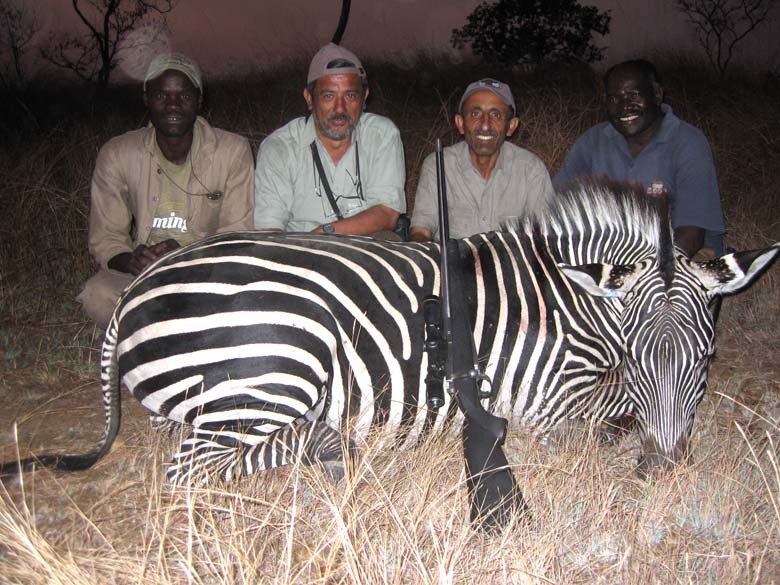 We have been hunting with our friends the Vincents since 1982, starting in Matetsi, then Westwood, then Chete and back again in Matetsi, in Zimbabwe. 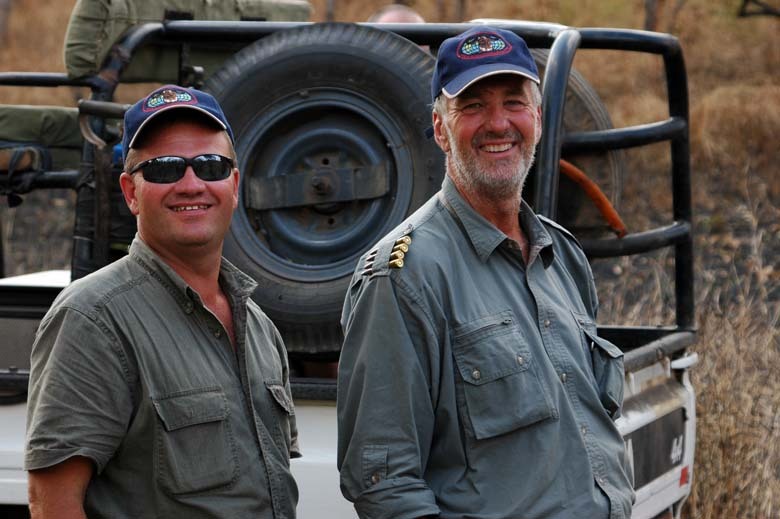 After a break of two years - during which we hunted with my friend Pierre van Tonder - we hunted this year again with Roy and Alan Vincent. 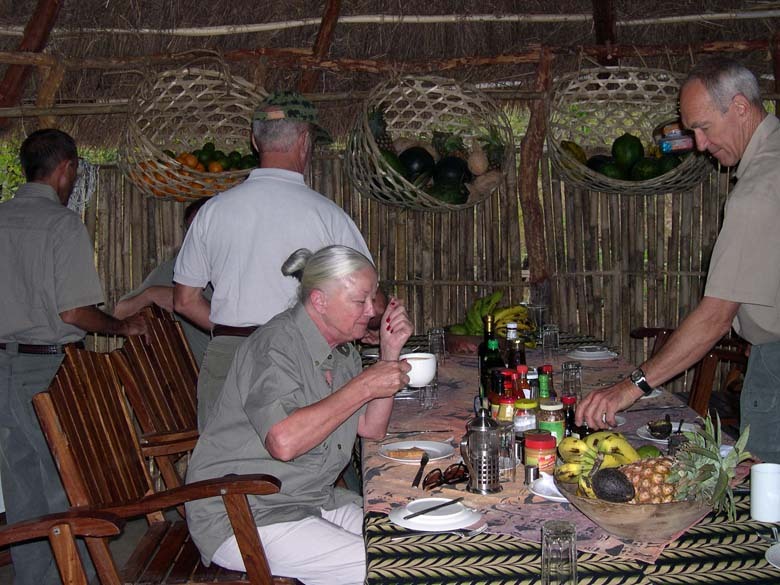 This time in Mahenge North, Tanzania. 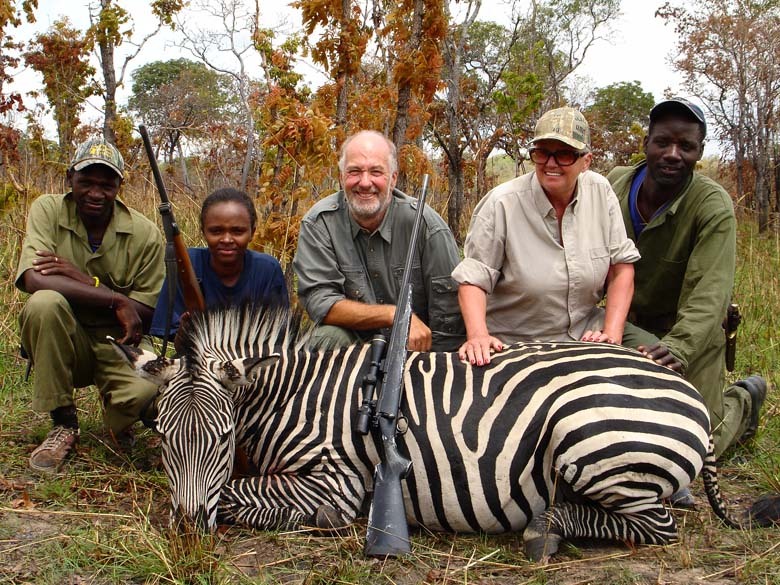 Jonathan Taylor, another PH from Zimbabwe, joined us and guided some of our hunters. The organization and logistics for such a large party as ours must have been a nightmare, especially as Walter was resident in the camp. But, everything was absolutely first class. The food was great, the accommodation was very comfortable, the atmosphere very lively, the since of humor was great, and above all, NO PC! We left Dubai on Emirates Air to Nairobi, where we stopped for about an hour, then continued on to Dar Ess Salam. 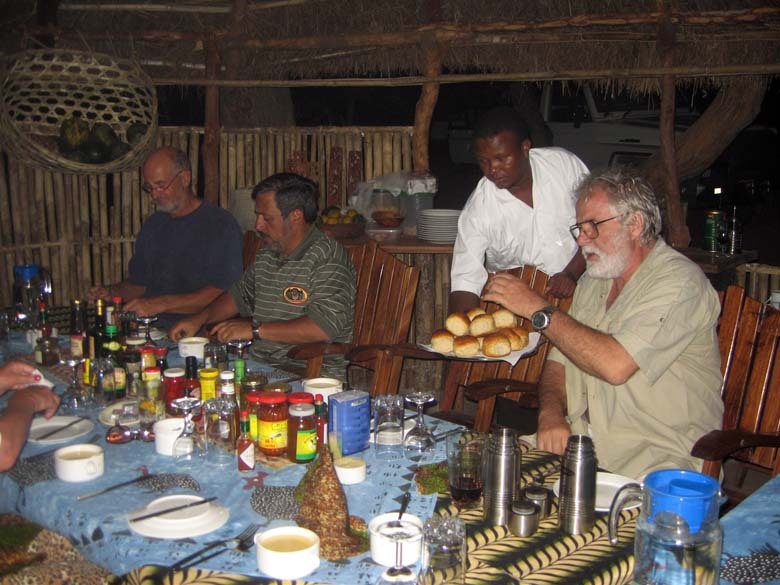 My friend captain Gerard Dessart was the captain, and he kindly came to the cabin to welcome us - and annoy Walter! It is really wonderful how people seem to take it upon themselves to get Walter going. The captain brought a map of Tanzania with him asking us where we were going to hunt. Walter, of course, immediately thought it was something else. He said to the Captain: "did you come here with your map to ask for direction because you are lost?" And before the captain could answer, he added "Don't ask Saeed. He has been lost since the day he was born!" 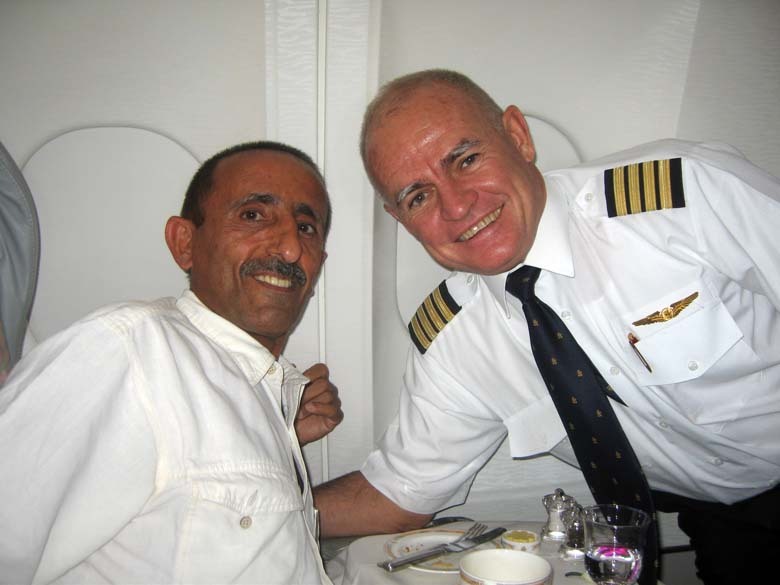 The captain asked the air hostess to get Walter a glass of wine. That kept him quiet! 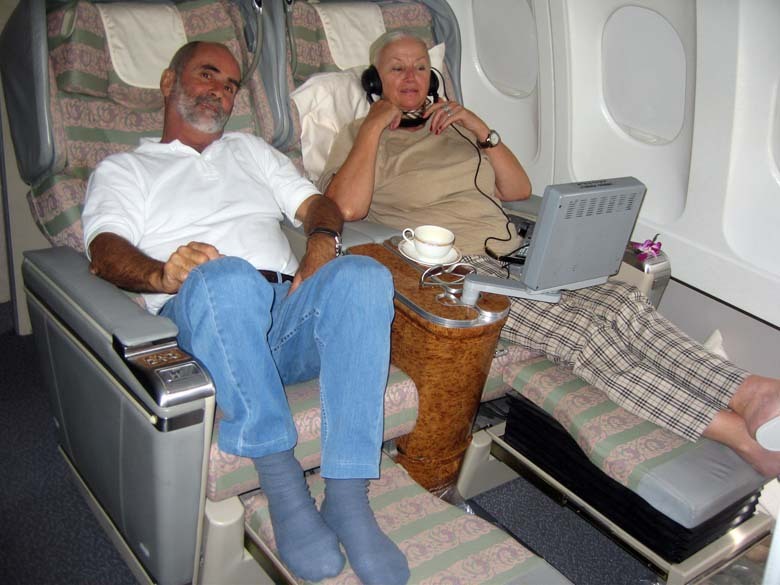 Horst and his wife Anna-Marie enjoying a cup of coffee and watching a movie on the flight. Of course, the service was as we have always expected from Emirates. The food was great, the seats very comfortable - I just had the misfortune of sitting next to Walter, who, thankfully, fell asleep as soon as he had eaten! At Dar airport, we were collected by a buss from the plane. The buss was so overloaded, its rear end kept scraping against the ground as it turned the corner!? We all laughed about it, as we did not have far to go to the terminal. Donald, Bundu Safaris representative, met us before we we got to immigration, took all our passports to sort out, and led us into the luggage collection area. Captain Dessart also came into the terminal with us. He said as Walter was with us, he wanted to make sure nothing went wrong!!?? We collected our rifles luggage, including rifles and ammo, and were out of the terminal in minutes. Donald did a wonderful job of taking care of all the relevant paperwork. We drove a short distance to the charter terminal, where we met our friends Dwight, Todd and Nelson. They arrived a day earlier. We loaded all our stuff into our charter plane - Horst takes care of being the unofficial loadmaster, despite all the protestations from Walter who wanted to "supervise" him! 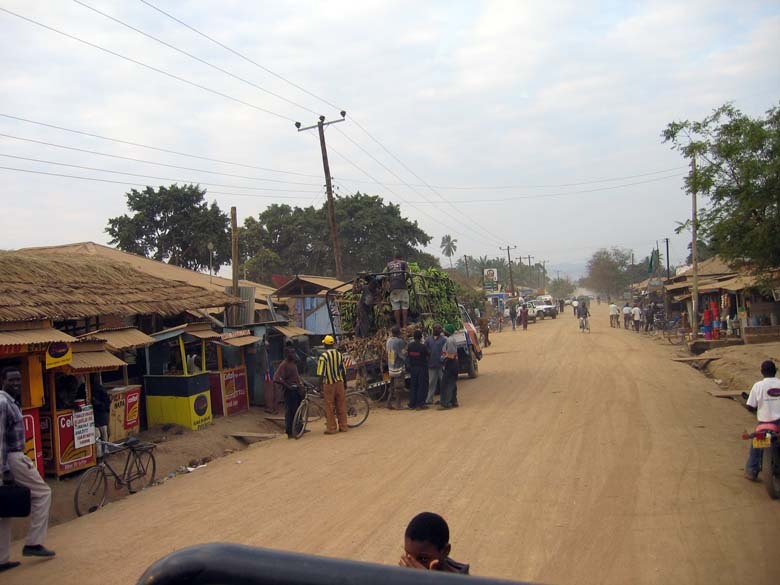 The village of Ifakara, where we landed in the bush air strip. 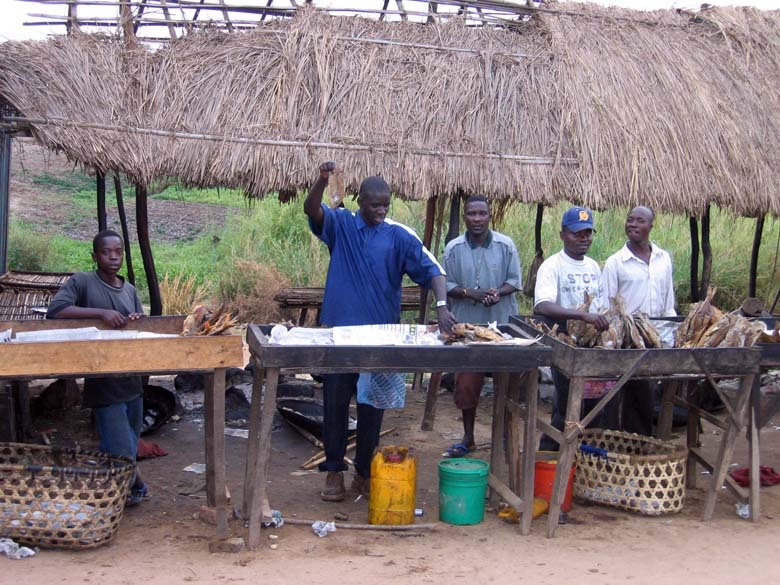 Selling dried fish caught in the Kolimbero River. 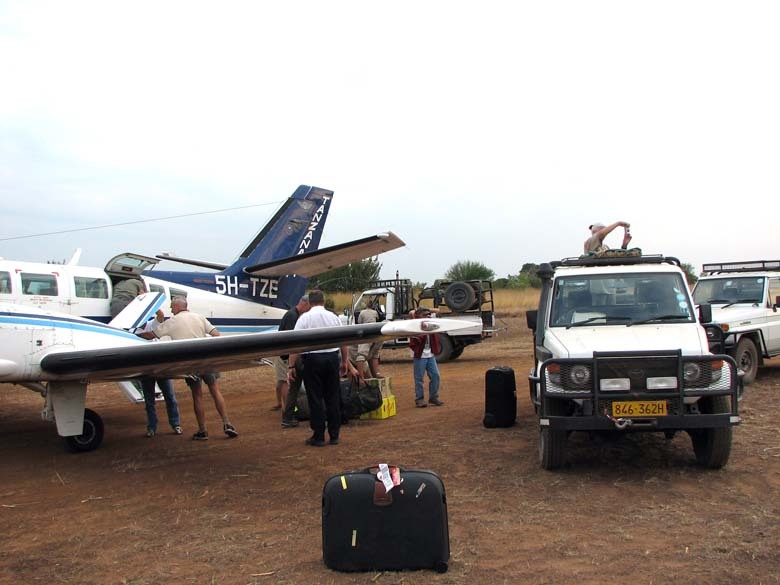 Arriving at the bush air strip after a flight of about one hour. Our camp. 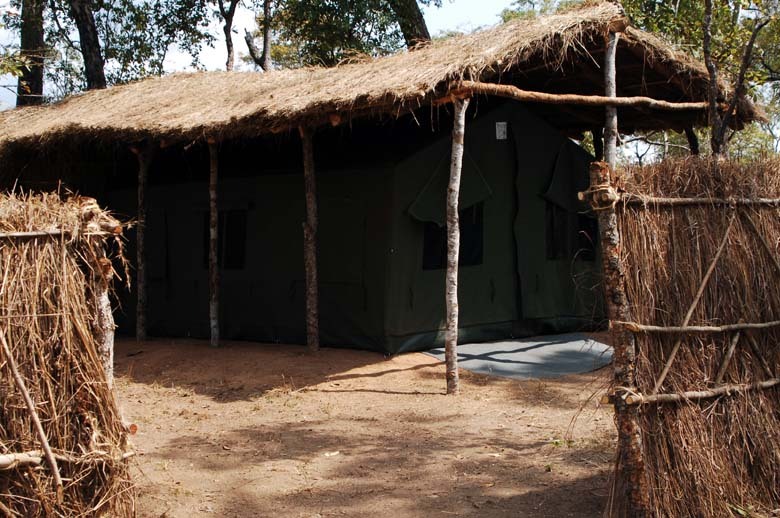 All the tents had a separate wall around them, as you can see above. Our dining room, with an open fire place and BBQ area on the other side. Sighting in our rifles. Dwight thought that I loaded his rifle, but I just cocked it, with an empty chamber. Everyone was anxious to see him flinch! And we were not disappointed! 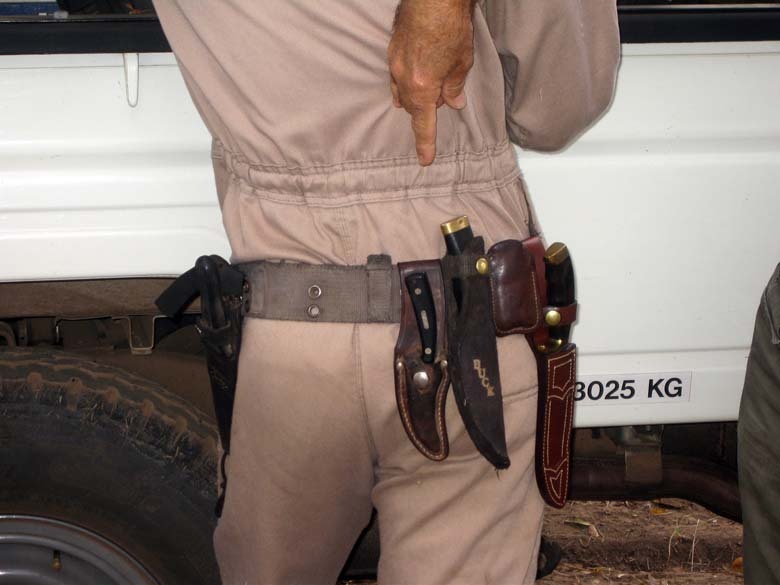 Philip, one of our trackers, with his collection of knives. I give him one every year, and all he does is add it to the previous lot on his belt. 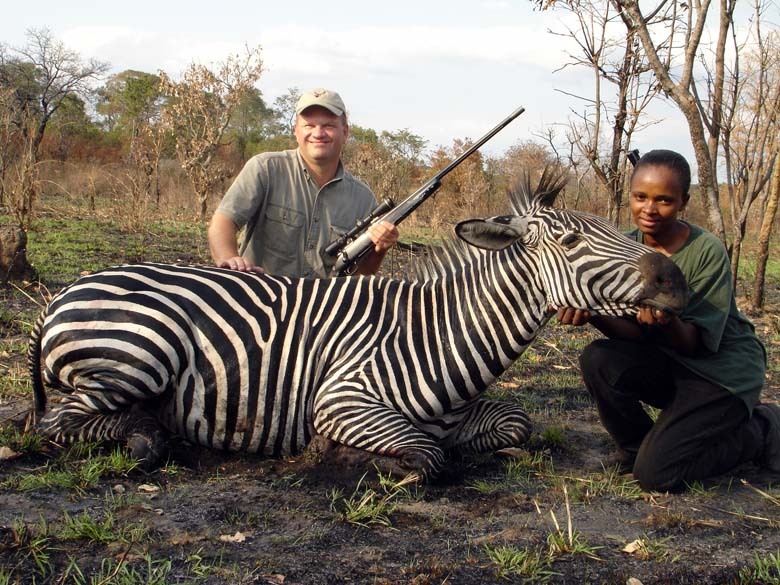 Todd and his zebra and his game scout. Walter with one of his trophies, shot by proxy by someone not in the picture. 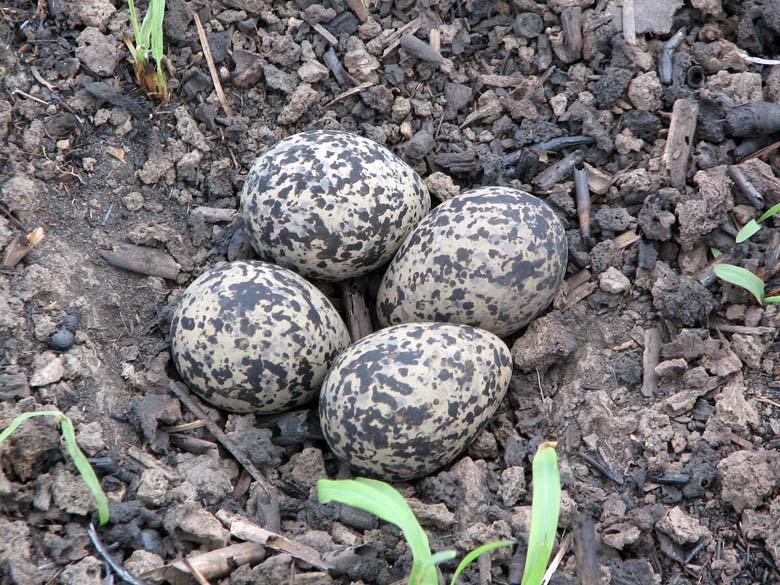 He said he discovered that he seems to get his trophy each time he sends out his "substitute"
Plover's eggs. Incredible camouflage, and very large for the size of the bird too. 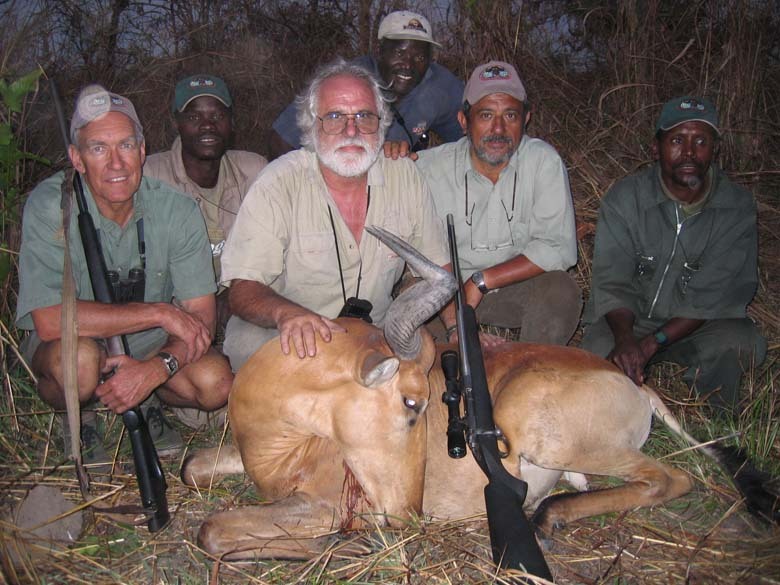 Nelson and his hartebeest. We are still unsure how he managed to hit it in the rear leg. 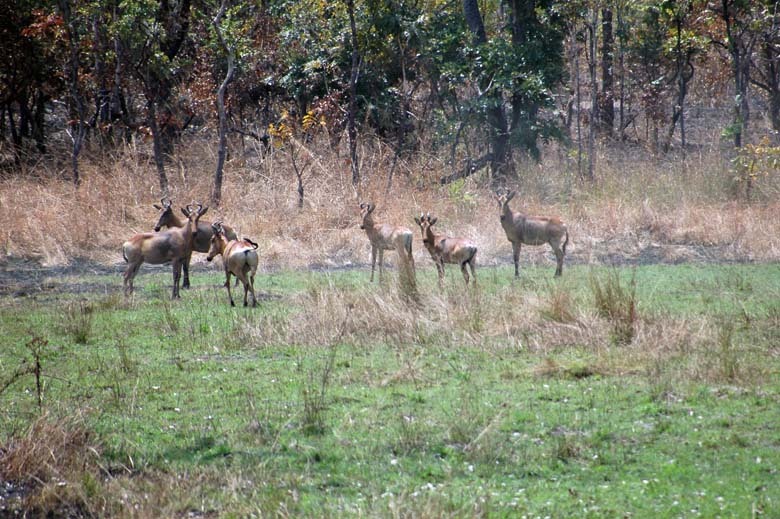 What happened was we saw this hartebeest standing in the bush. His front half was clear, but his rear half was hidden behind a tree. Nelson shot him, and he took like a bat out of hell! We went to look for him, and found a few drops of blood. We followed the tracks for about a mile. And he jumped from about 3 yards ahead of us from the grass. Both Roy and Nelson fired at him, killing him instantly. The first bullet seems to have been deflected by a twig, changed course by almost 90 degrees - or so it appears - and broke one of his rear legs. I wonder if Pepsi will pay me the same amount of money as they did Michael Jackson! We saw this waterbuck with a few others, and stalked them. Eventually we managed to get to about 250 yards of him, and I fired a shot at him. It was a clean miss, which surprised all of us, as I had a solid rest, and nothing seems to be between us. They ran off to the top of the hill. We walked up to them again, and managed to catch him walking about 80 yards from us. He was not so lucky this time. 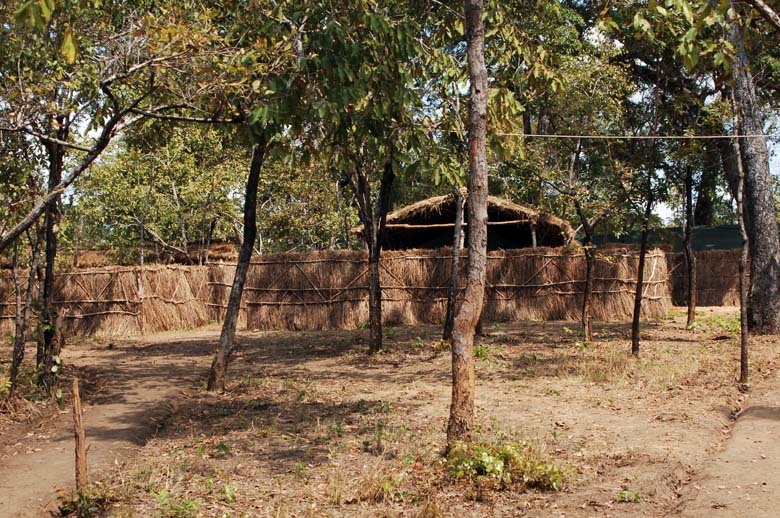 When we first arrived in Mahenge, there was grass everywhere. So we started to burn some of it. This helped the visibility quite a bit, but, created another problem. Twiggs! They are so hard to see, and play havoc with bullets. 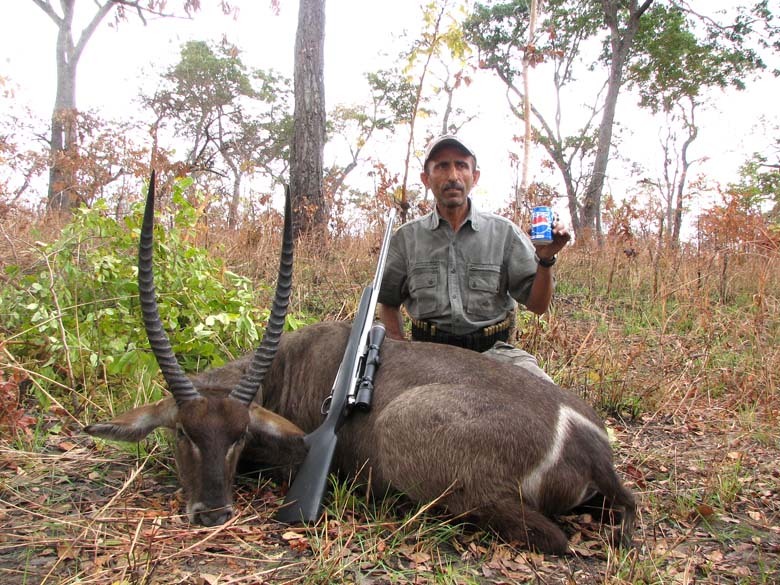 In addition to this waterbuck, I also missed a zebra and a hartebeest because of them. The stick that saved Walter's bacon! 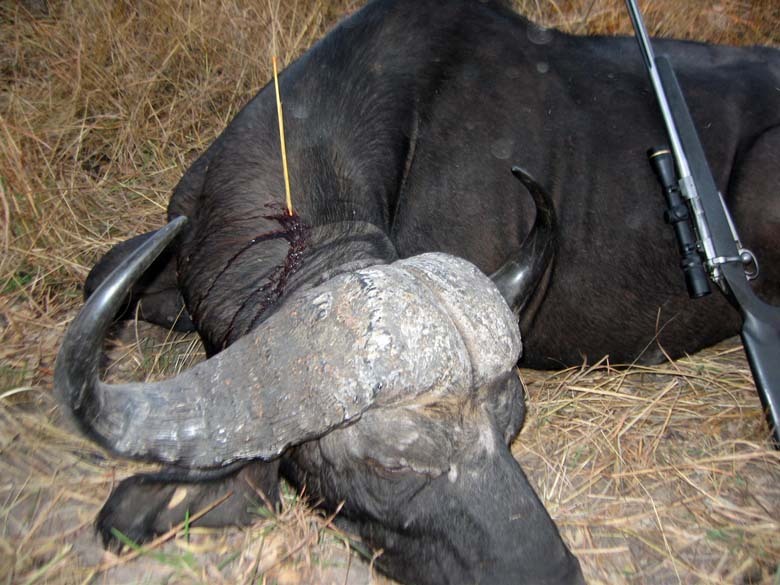 When he wounded a buffalo bull, we were ready to tie him up and put him as hyaena bait. 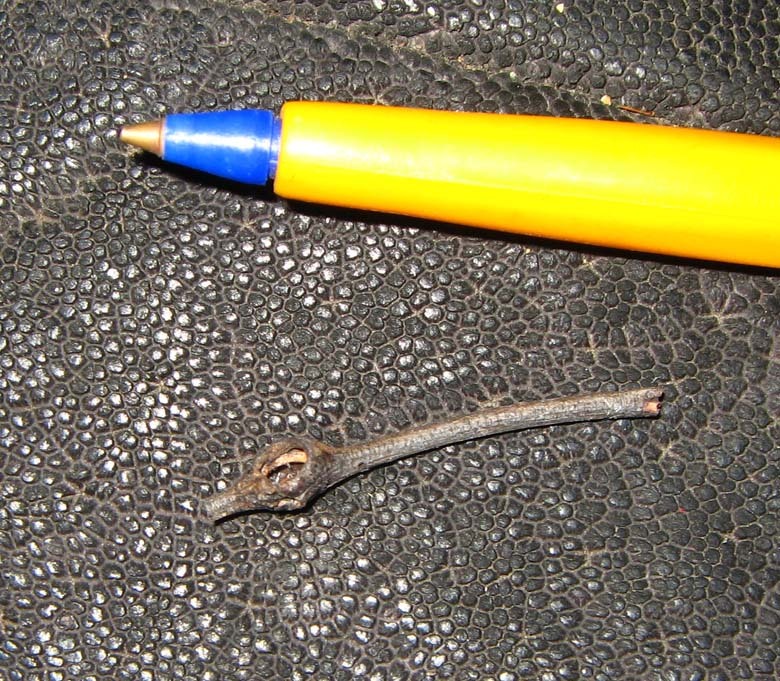 We then found this twig which he killed! 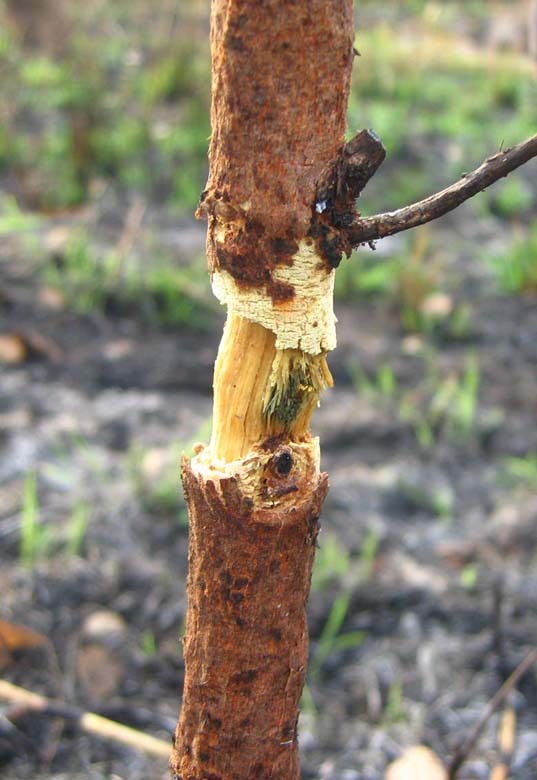 We had a bet with him, that we would give him 100 rounds, and see if he can hit this stick, from the same distance. He declined, admitting defeat. 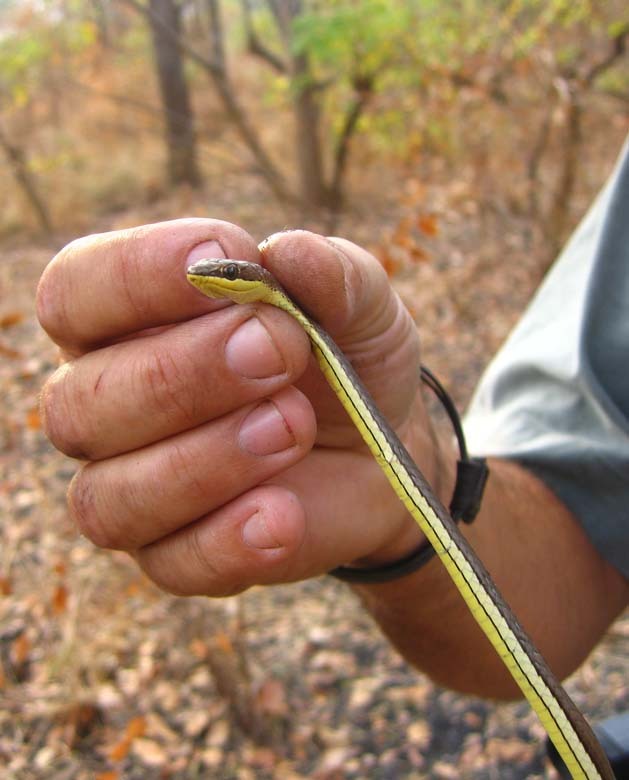 A small snake that got killed by Walter's buffalo as he ran off after being shot. Talk about having a bad day! Todd and Dwight. With Dwight inventing a new way of carrying your ammo! 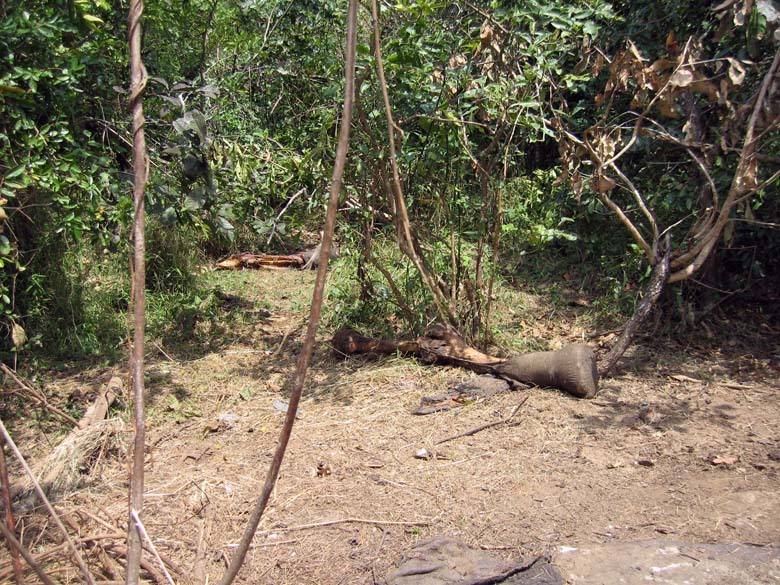 The remains of an elephant killed by poachers a few days earlier. 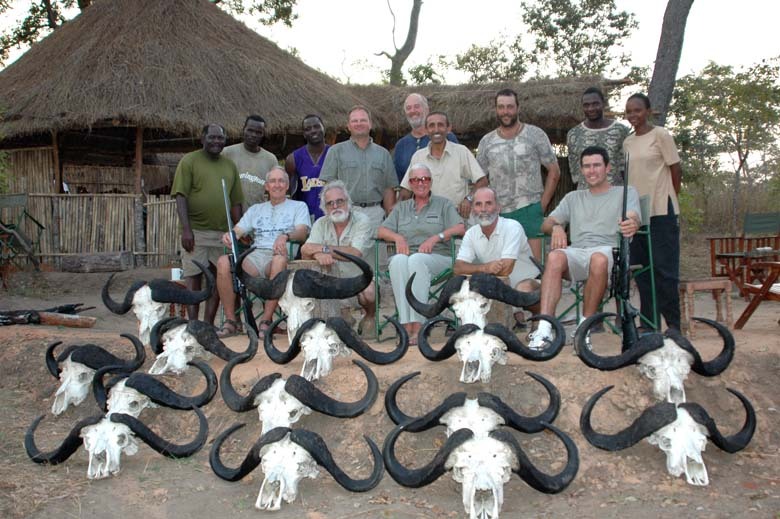 We found quite a number of elephant remains of those killed by poachers within the past couple of years. 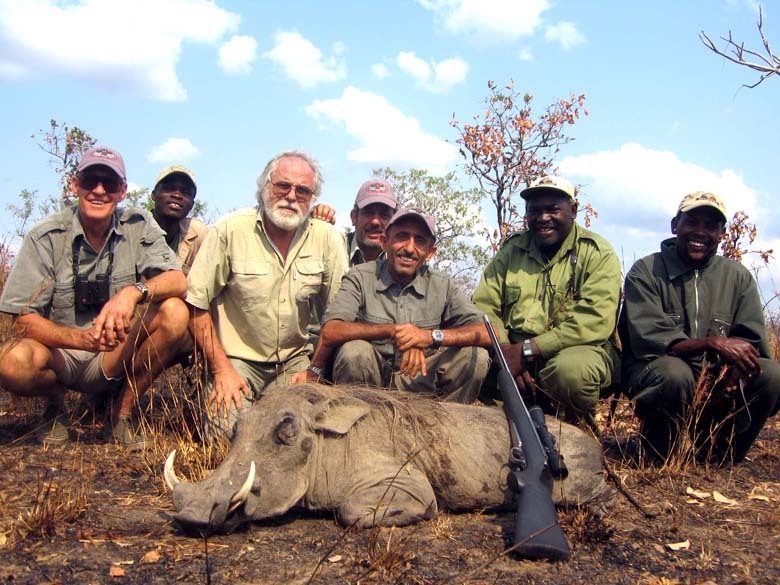 We had a lion bait by a hippo pool, and poachers cut it down, and burned that area up. I suppose they did not wish to have lions close by. We just finished stalking a herd of wildebeast, crawling on our hands and knees, so Alan decided to take a photo of us. Actually, this one is not really that bad. As we ended almost every day in a much worse state than this. 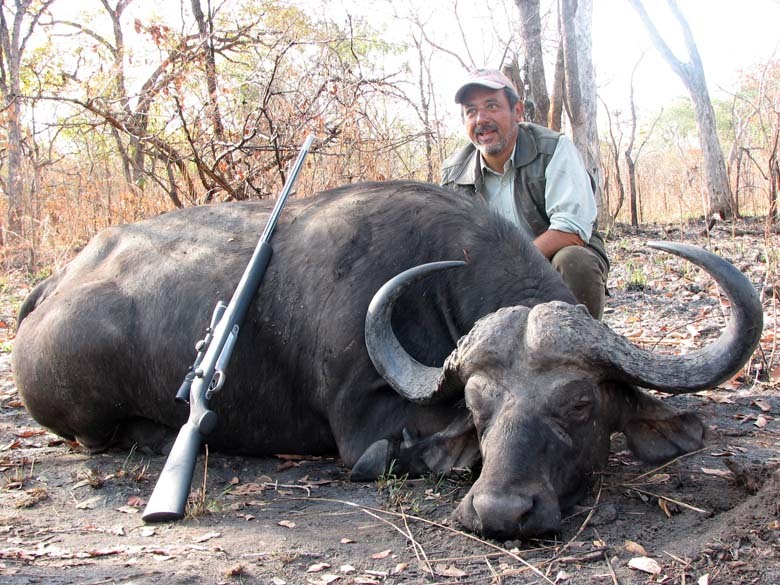 Going by the book, I shot this buffalo precisely as recommended in so many books on buffalo hunting, just as he lowered his head to toss me! It was not so easy, with him coming at 30 miles an hour, with his plowing through the long grass. But, I stood my ground, as I knew I would only get one shot, and I better make it count! OK, Hollywood acting is over, and I better tell you the true story behind this shot. We were driving in a valley, when our trackers so some wildebeest far away on a hillside. We stopped to look at them, as so far we have not seen any bulls at all. They were all walking from right to left, about 1000 yards away. There were quite a lot in that herd, and we were hoping we might see a bull amongst them. Suddenly we saw some buffalo following them. We waited for them to get out of sight, and followed them. They went up to the top of the hill, then started feeding back down towards the valley. They were about 200 yards from us in very long grass, and so far we have not managed to get a clear shot at any of the bulls. 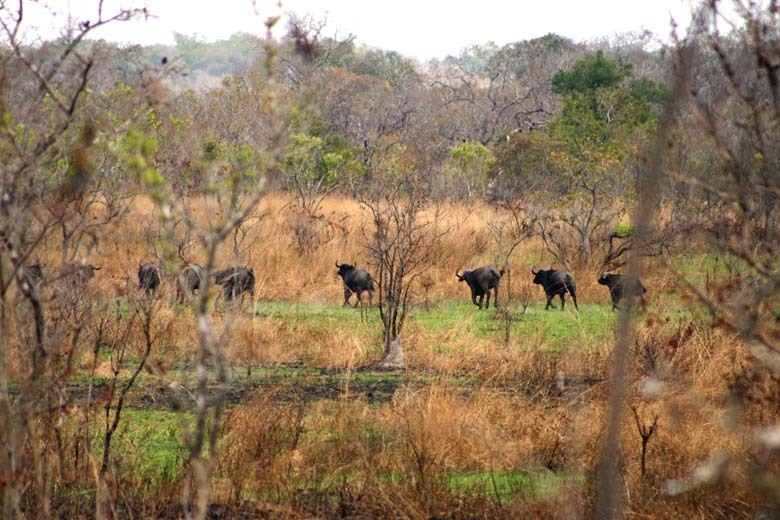 Suddenly we heard the other truck coming, and we got scared they might frighten the buffalo away. Walter, who was waiting by our truck, managed to get their attention, and got them to go back to where they came from. The noise of the truck worked to our advantage, as the buffalo changed course, and turned back to feed back to the top of the hill. 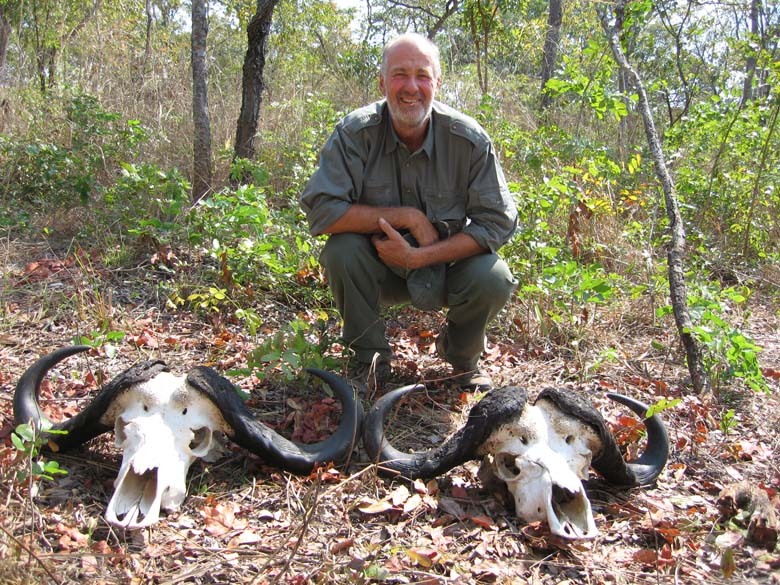 We could see quite a number of bulls heads, but they were all relatively young, and the only way I could have shot one would have been in the head. Alan then saw this one feeding towards us, about 35 yards away. As he lowerd his head, I fired a shot at him. He dropped where he stood. The rest of the herd ran off for a few yards, then stopped. 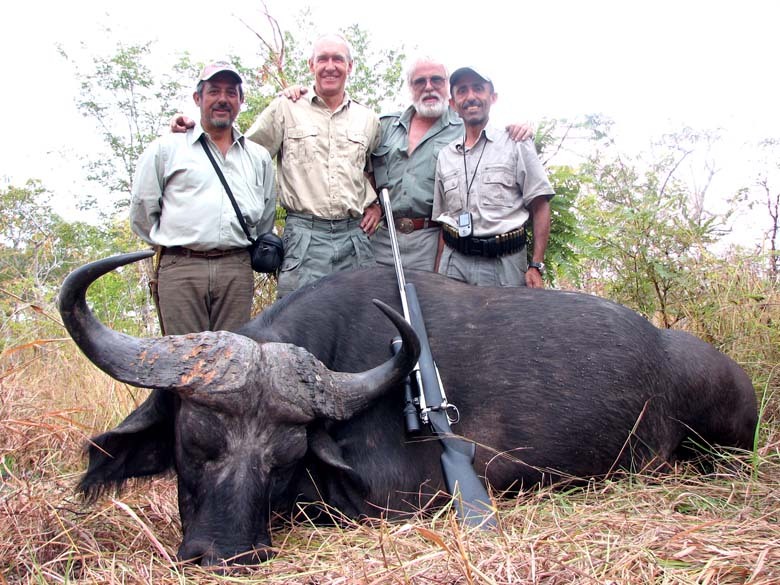 We tried to shoot another bull, but, the one we wanted was in the middle of the herd. We walked up to this one, and put another shot into him as we usually do. Walter discovered this pipe, saying it was made by siafu ants! 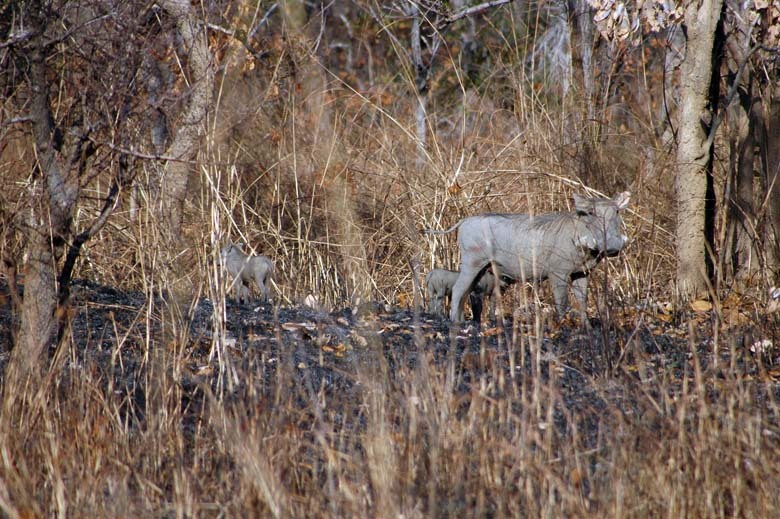 Mommy pig and her babies, wondering what the hell were these two legged creatures. We stopped at the other end of this valley, as we wanted to walk into it and see if there was any animals we could shoot. We have not gone more than a couple of hundred yards from the truck when we saw a herd of buffalo feeding at the far end, about a mile away. The wind was right, so we continued towards them. 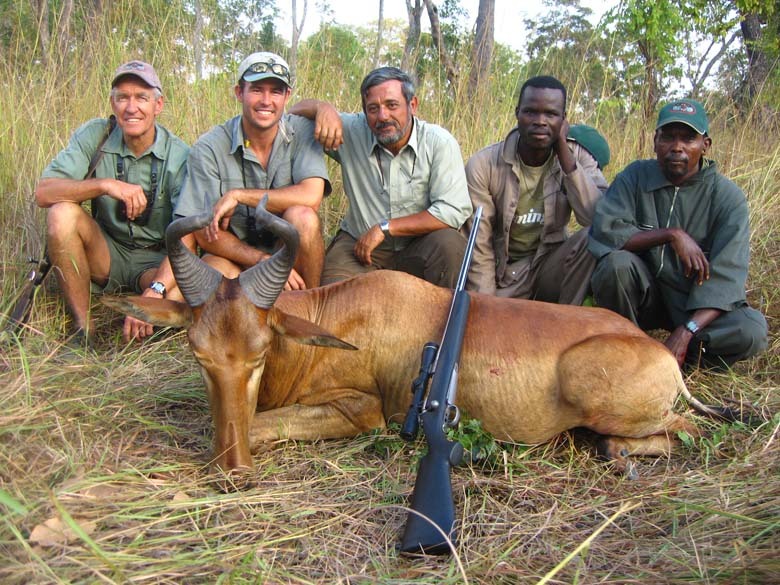 We came across a herd of hartebeest, which we managed to skirt. 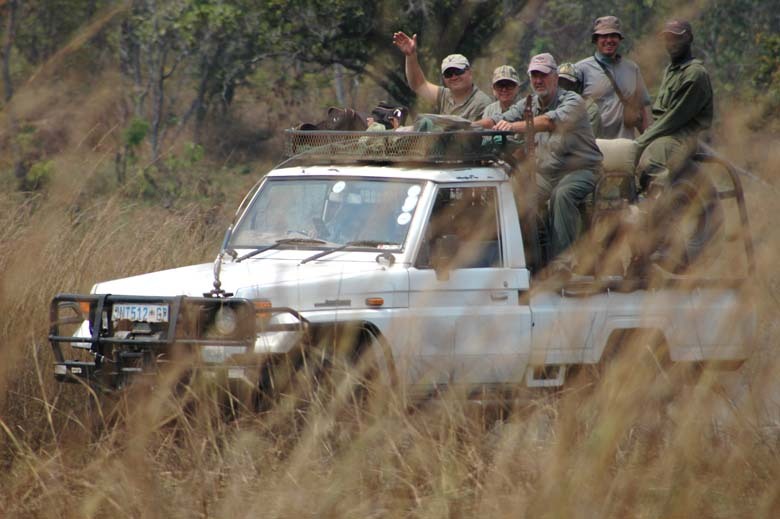 Then we saw a herd of sable, luckily far downwind of us, and the way they ran was away from the buffalo. The herd was feeding just in the treeline, and we had about a 200 yard burnt area between us. We walked slowly to the edge of our side of the trees, and started to look for a bull to shoot. 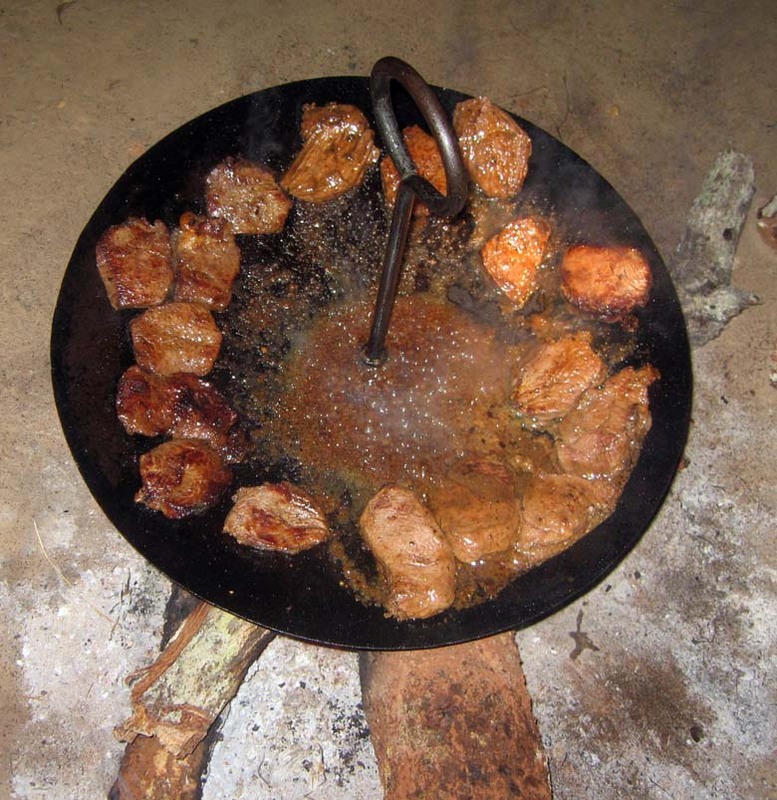 The buffalo continued to feed away from us. We picked one bull, as he turned back with some cows. We were in the trees, then there was a clear area, then the buffalo in some trees at the other side. I think this must have confused us to the distances involved. I thought we were about 220 yards from them - Roy later said he actually told me they were 300 yards away, but I never heard him! 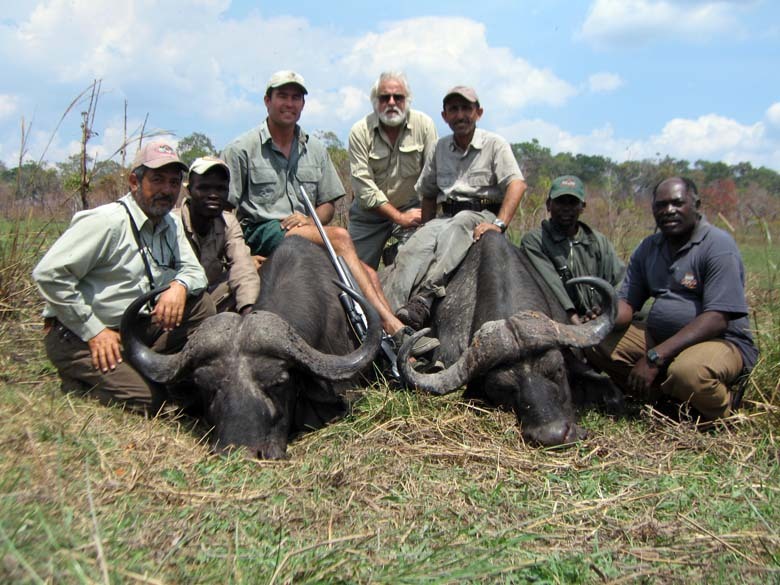 Anyway, I shot the bull on the right as he walked through a clearing. The whole herd took off for a few yards, turned around to look behind it. We thought they might have been looking at their fallen comrade. 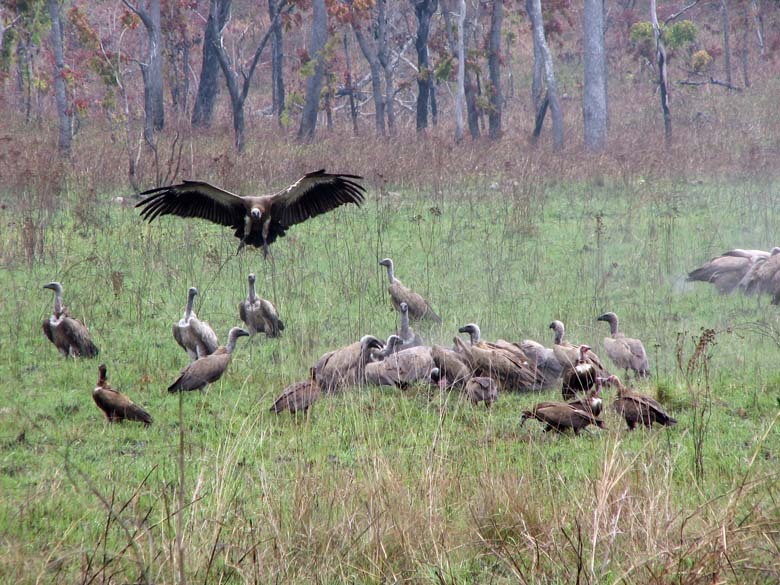 Then they all started running to the right, coming into the clearing, and getting closer to us. We then saw this bull with a broken front leg. They stopped, with him amongst the herd. As he got clear, I shot him, hitting him in the head. The rest of them ran to our right, then changed their mind and turned to the left. One bull was trailing behind, and Roy told me to shoot it too. I did, and he continued running. Another shot dropped him, but he was struggling to get up. I put another shot into him, which brought him down for good. Our first bull was still alive, so we walked up to him and finished him off. 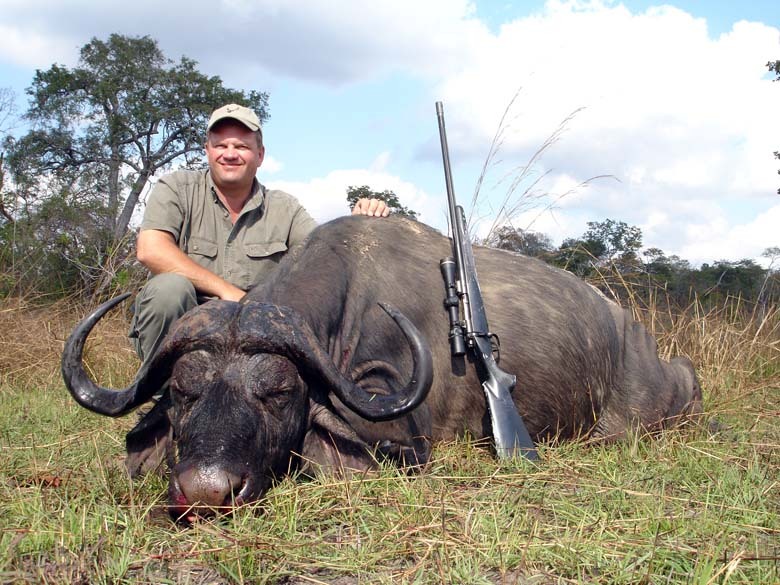 When the truck came, I took the range finder to see the distance at which I shot the first bull from. I took several readings, because I could not believe it at first. 344 yards! One of the lionesses we fed regularly. This little guy was hanging onto our windshield for quite a while. 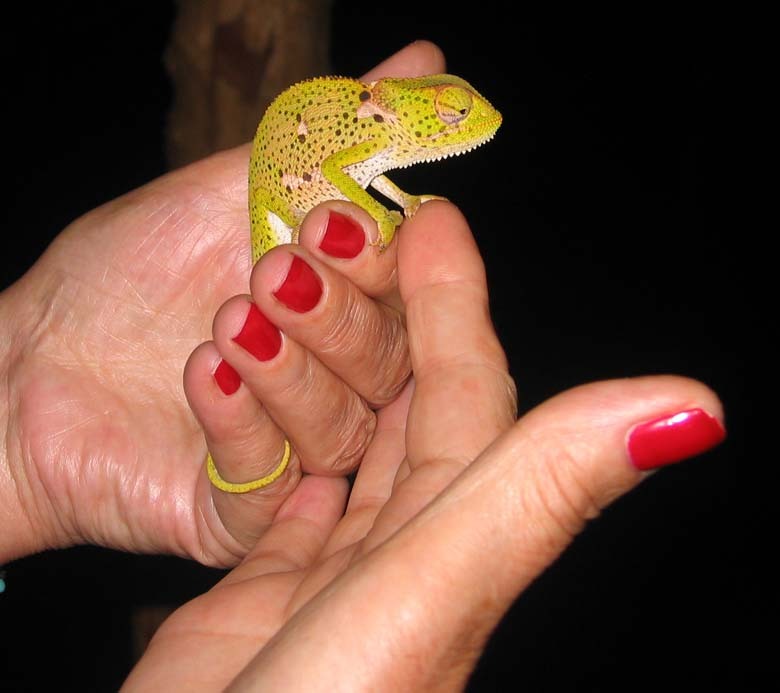 It is another chameleon, about an inch long. Nelson and his buffalo. Him and Roy had quite a performance. It was just before sun set, and a herd of buffalo was feeding about 80 yards from the. 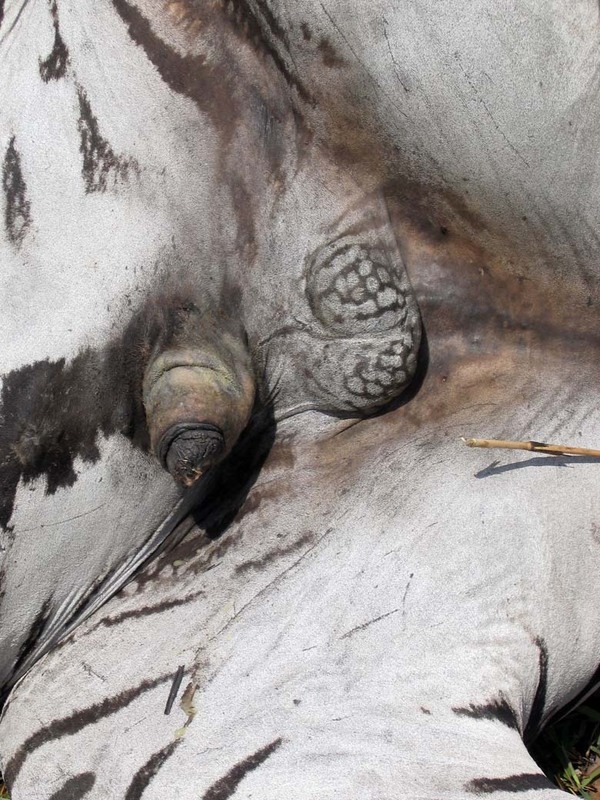 This bull was standing almost broadside, but Nelson was not able to see it. "Do you see the buffalo?" asked Roy. "No!" answered Nelson. "Do you see that tree?" "Yes"! "The buffalo is right next to the tree. Can you see it now?" "No" came back Nelson's answer. Roy took off his binoculars, and handed them to Nelson. Nelson look through them, and said "AH! Now I see the buffalo!" He gives back the binoculars to Roy, then looks through the rifle scope. Roy asked again "Do you see the buffalo now?" "No" came back the answer again! The bull moved a bit, and Nelson saw it. He did not waste any more time in putting a 300 grain Walterhog bullet into him. The bull ran a few yards and dropped dead. On most days, we did not return to camp for lunch, but stopped somewhere shady and raided the cool box. It normally contained sandwiches, left over meats from the night before, tinned food, fresh fruits, nuts, biscuits and assorted drinks. 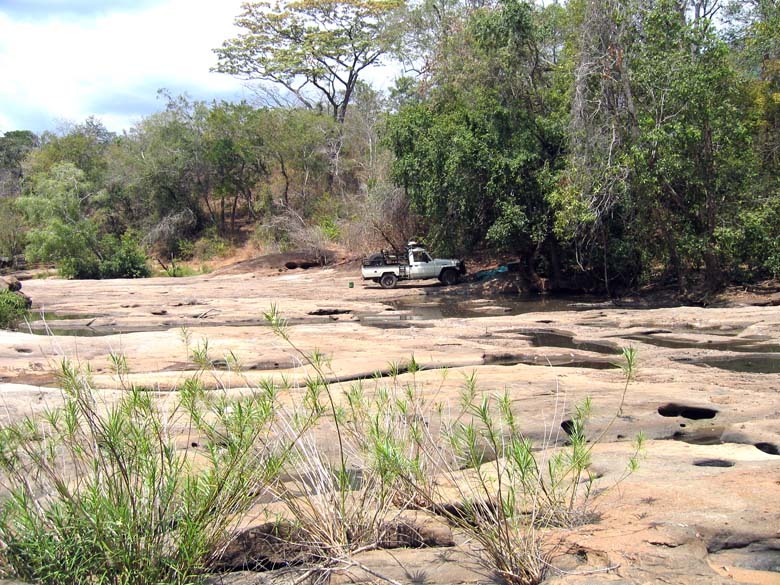 There were quite a number of pools of water in this river, with fish in them. 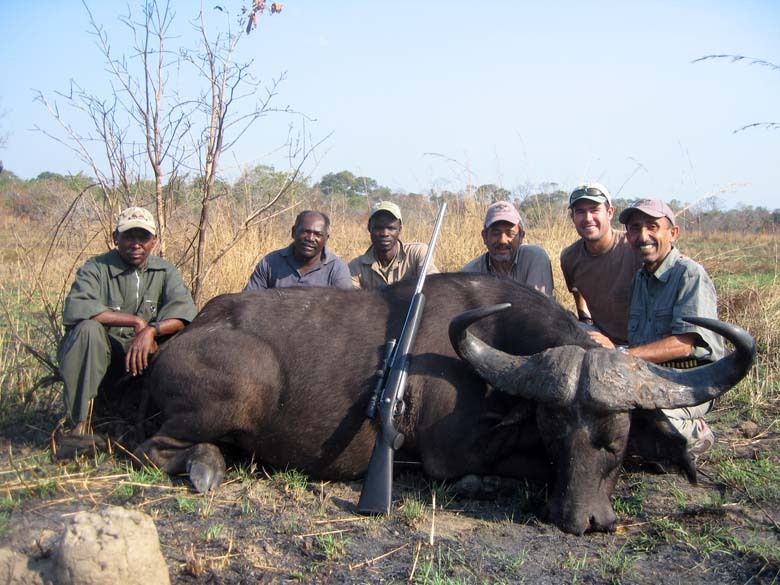 Our first buffalo, on our first day, hence all the smiling faces. We followed this herd from early in the morning, and caught up with them relatively quickly. 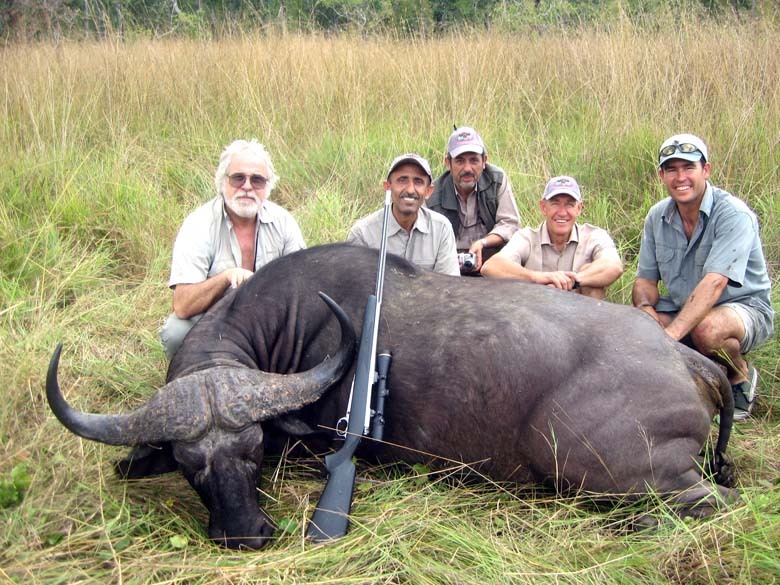 But, due to the high grass, it is impossible to get any chance of a shot at one of the bulls. Once you see one, he would either be behind a cow, or only his rear end is clear. 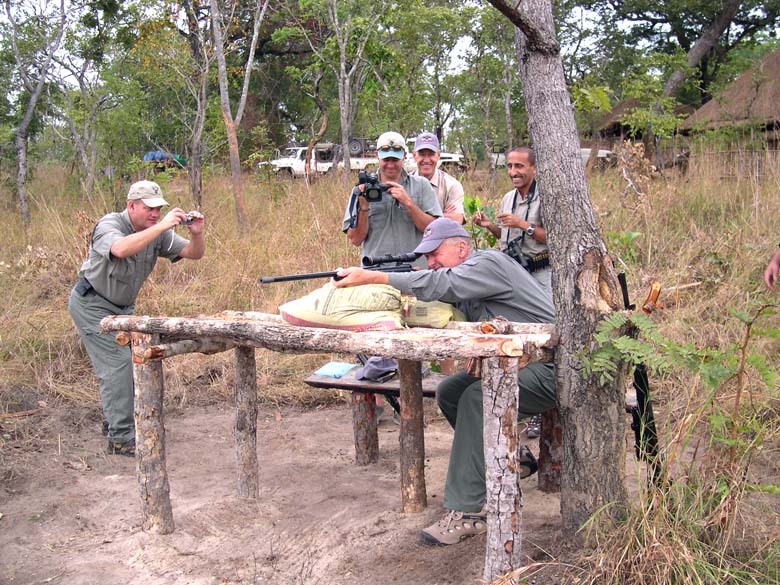 We did not want to take a chance at shooting in the herd when we were not sure that there is no animal behind him. Knowing that our bullets tend to go right through a bull standing broadside. Eventually, the herd sensed our presence, and ran off to our right into a clear area. Luckily, they stopped about 120 yards below us. This gave us the opportunity to see them in the clear, and Roy picked this bull just as he was taking off ahead of the herd. I had to take a hurried shot at him, and broke his spine. We ran over to him, and I fired two more shots into him from a few yards. One bullet must have hit something, as it tumbled and entered his chest sideways. 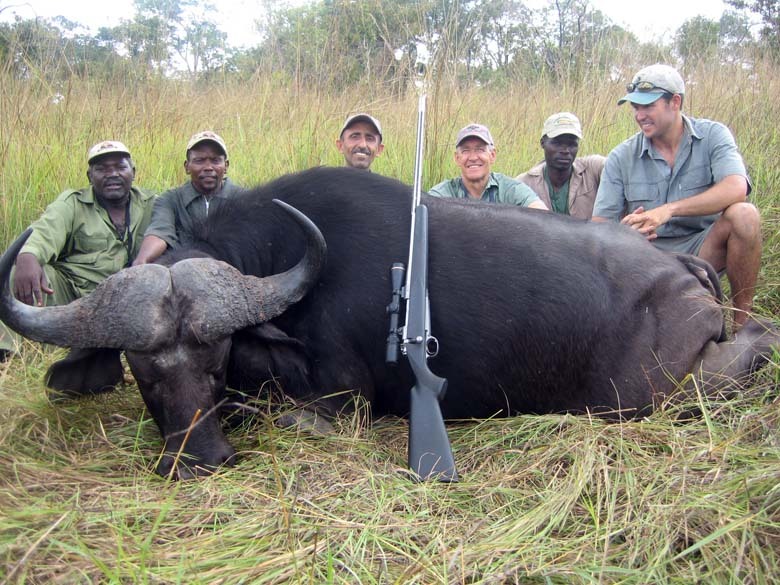 Walter wanted to shoot a buffalo, and got himself so worked up about it, that he kept telling us he had "calibrated" himself for buffalo. 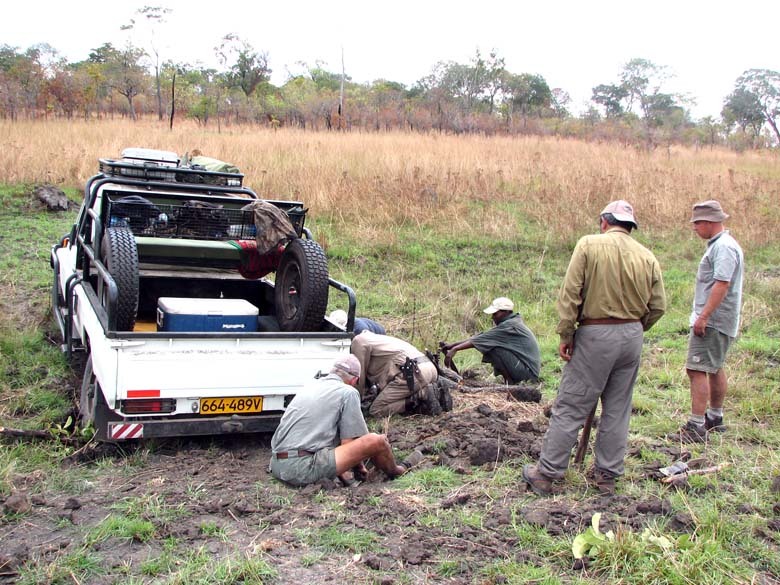 In fact, he was so engrossed in this, he refused to shoot a warthog standing right by the truck! We were out in the afternoon, and saw a herd of buffalo feeding about a mile away. The wind was right, so we asked Walter to get off the truck, and walked a bit to get ahead of them. He refused, handing me the rifle, saying "I will let you shoot this one. You need the practice!" We went off and sat ahead of the buffalo as they fed parallel to us. Roy put up the shooting sticks and said to me to get ready. As this bull was going to walk through a gap in the trees about 200 yards away. As he passed through the gap, I let him have it. He took off, ran 27 yards, and dropped dead. The bullet went through the top of his heart, part of it breaking up in the process, tearing the heart apart. The rest of it was found under the skin on the opposite side. It looked like it was very brittle, and parts of it just shattered off. I can only guess at what happened. Some of the copper rod we use for making our bullets have tiny air pockets. We try to cull these before we actually make the bullets. It looks like one of those rods must have gotten through. I cannot blame Walter for it, as I am the only person making the bullets. At the breakfast table. Me, Horst, his wife Anna-Marie and Roy. 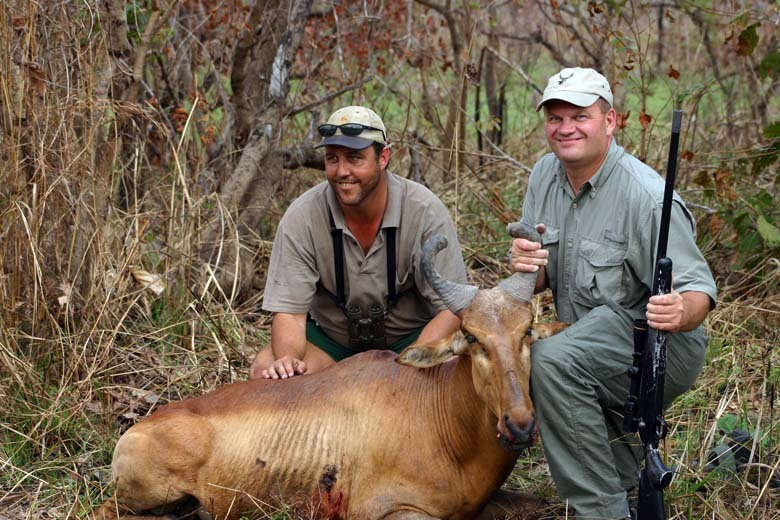 My friend Todd Kindler and his PH, Jonathan Taylor and a hartebeast. Both Todd and Dwight used my spare 375/404 for all their hunting. And to say that Jonathan was impressed with their performance is an understatement! I told him it was all due to our magic bullets, not because of their shooting ability! 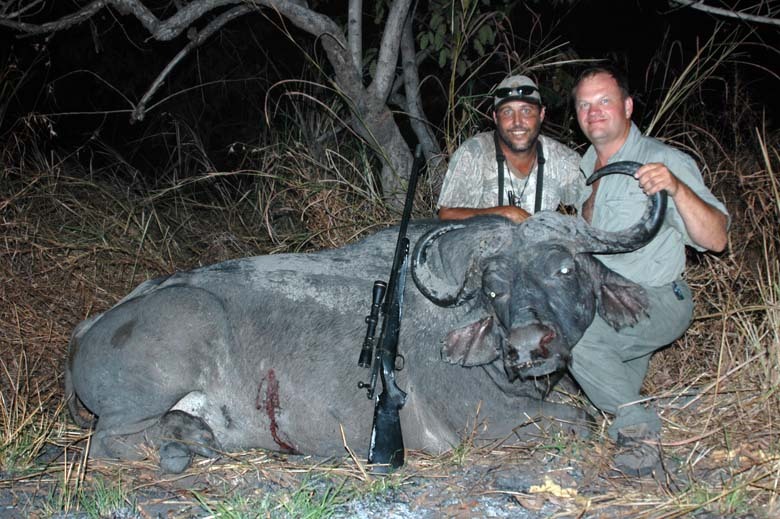 Another buffalo that we had to chase most of the morning. We followed the smaller part of herd that split up as it fed. Thinking the bulls might have decided to leave all the cows and calves, and go somewhere quieter! We followed them for an hour, and caught up with them. 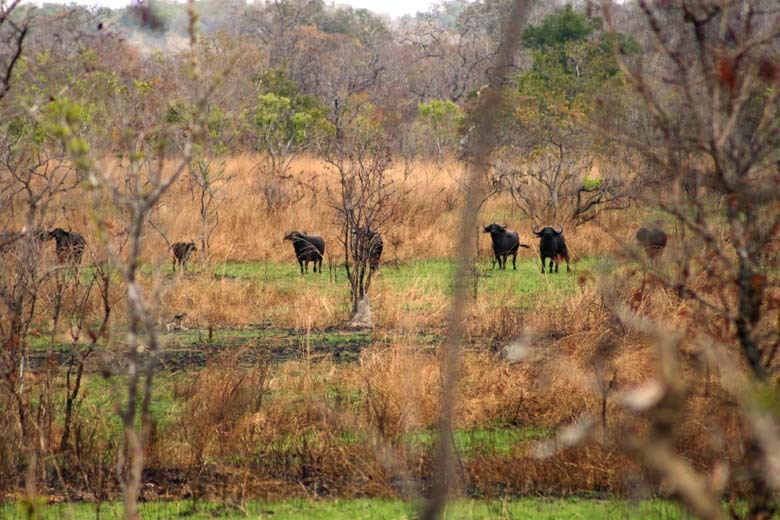 They were feeding in a burnt up area, with a herd of wildebeest. We watched them feed, and tried to find an adult bull to shoot, but, there was none. We decided to go and follow the other part of the herd. 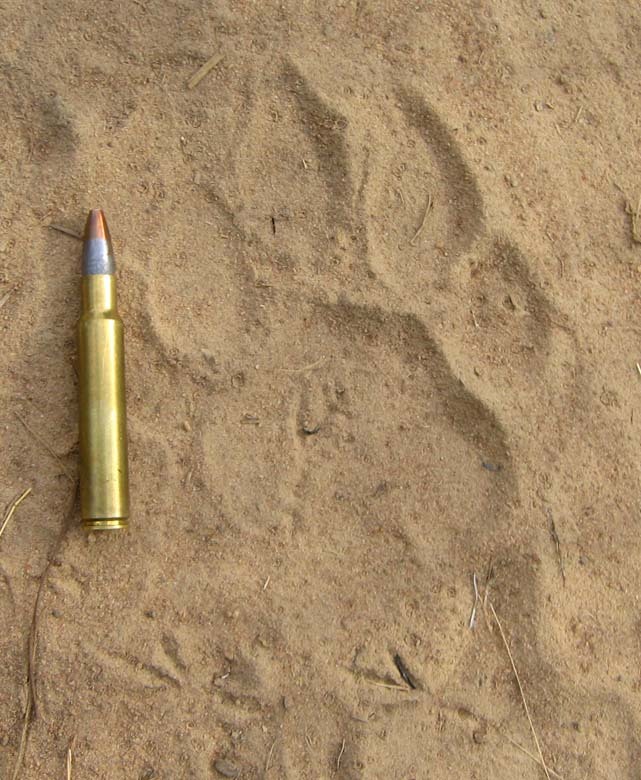 So we asked our Masai tracker to get us back to where we had left the tracks. He must have turned on his afterburner! He really took off, with us jogging behind him. This again took about an hour, when we caught up with a very big herd feeding in very long grass. We got closer and closer, seeing buffalo spread ahead of us for a about two hundred yards. 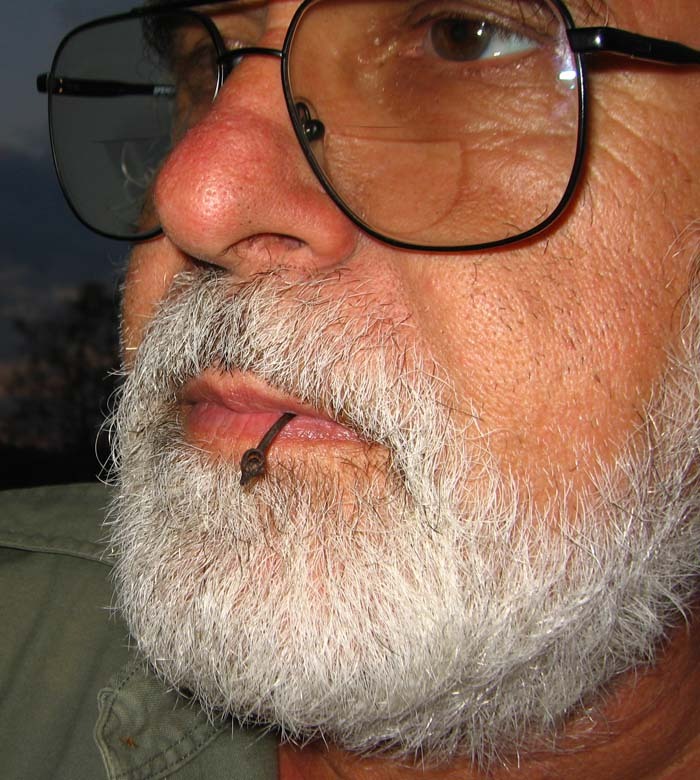 Roy was looking through his glasses trying to locate a mature bull. This was not that easy, as all we could see was just the top of their backs, and as they fed, the heads were in the grass, so no horns could be seen. Then I noticed the grass moving about 10 yards ahead of us! There was one cow feeding that close, without us seeing it. We withdrew back as quietly as we could, then resumed our stalk. Eventually, through a gap in the grass, we could see this bull feeding on a facing hillside, about 100 yards away. I fired a shot at him, and he took off in the direction he was facing. We ran after the rest of the herd, trying to shoot another one. But, we just could not get any clear shot at any bull. 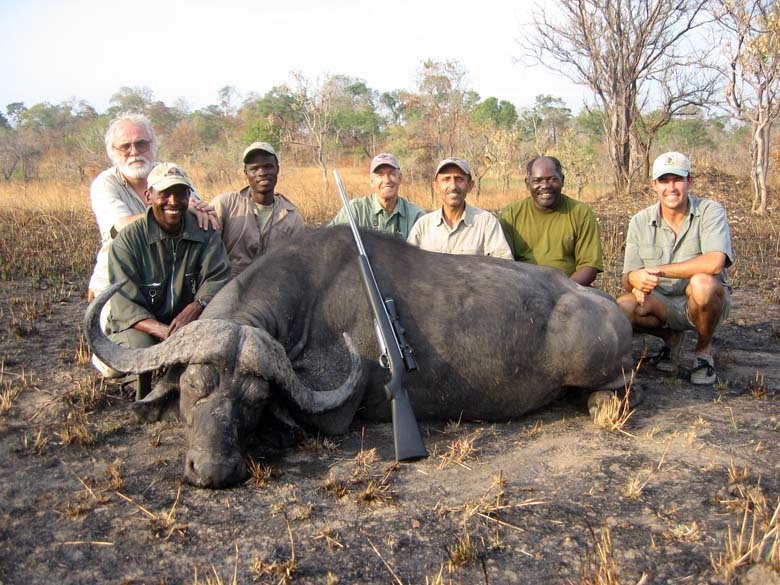 We walked back to our downed buffalo, and found Nelson, the game scout and the trackers standing next to it, laughing their heads off. Apparently the herd turned back, and ran straight down the valley where this dead buffalo was lying, and our boys. The trackers and game scout each ran up a tree, and Nelson luckily ran up hill to avoid the charge. 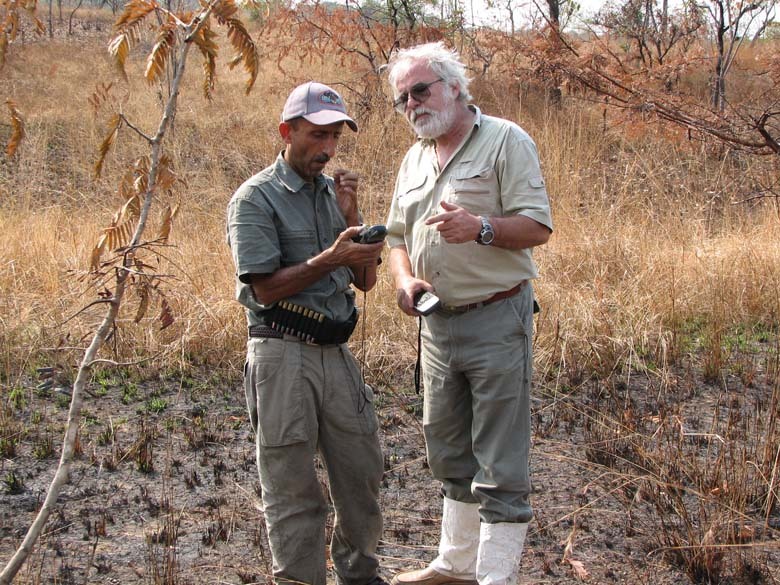 Our Masai tracker seems to have a built in GPS system, so Walter and I decided to see if we could confuse him! Here we are calibrating our GPS. And despite all our efforts, we were not able to get him to get lost! 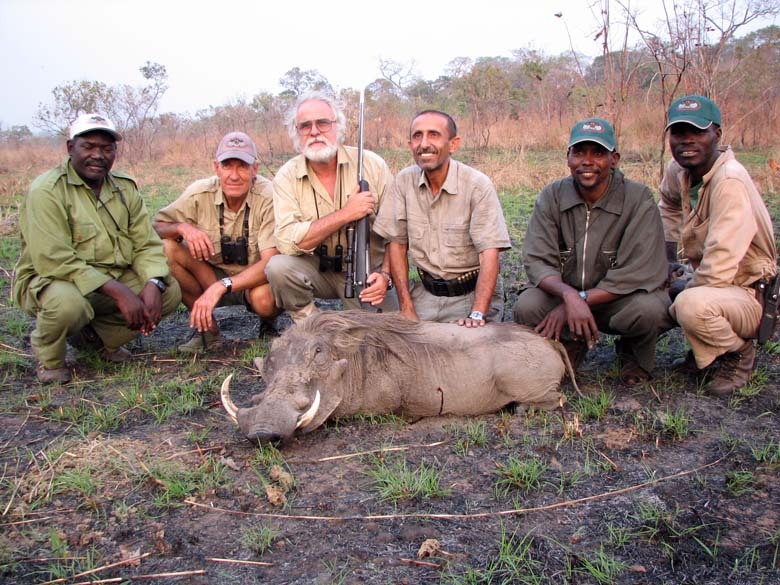 An an lucky warthog that we came across as we chased a herd of hartebeest. The hartebeest went over the hill at break neck speed, so we decided to add this warthog to our menu. 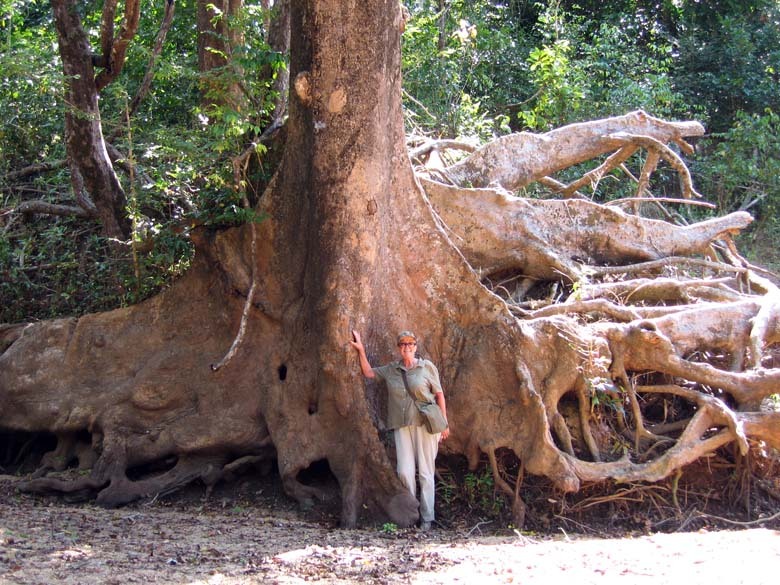 Anna-Marie standing next to one of the ancient trees we found. 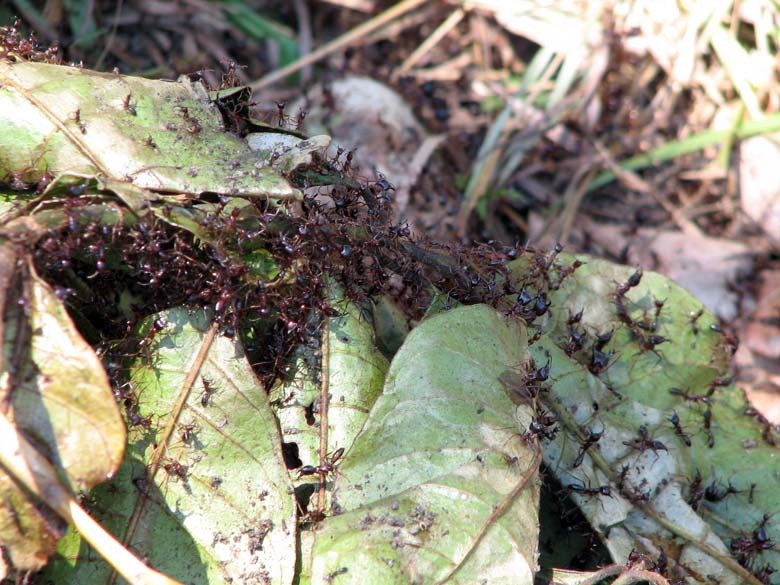 The famous "Siafu" or army ants. I made the mistake of standing on one of these columns - unseen by me, as we were walking in thick grass. 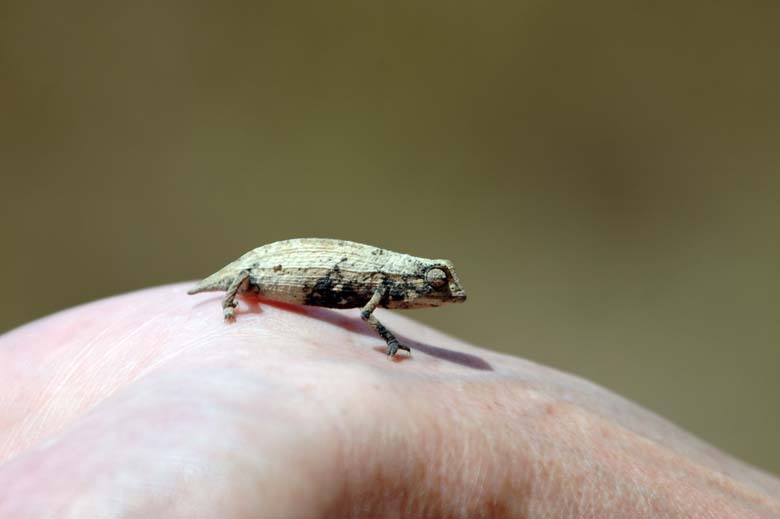 About several hundreds of them walked up my trouser legs, and at a pre-determined moment, they gave the signal to bite! Michael Jackson could not even dream of the sort of dancing I did! Once these hold onto you, there is no getting them off without killing them! 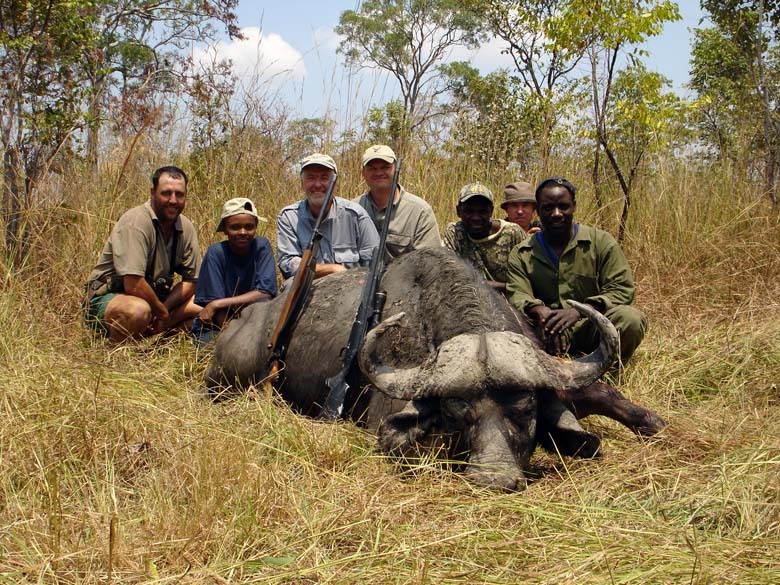 Another warthog Walter missed on shooting because he was "calibrated" for buffalo, and did not wish to have that fine calibration ruined by shooting a lowly warthog! 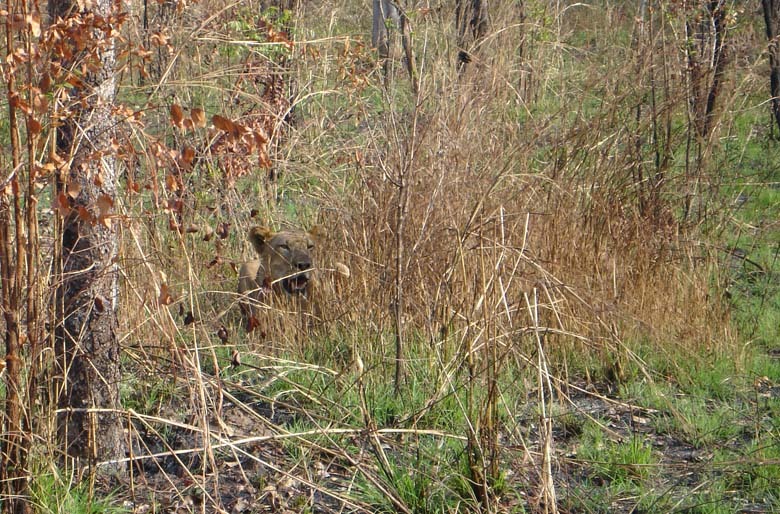 We were on the way back to camp late in the afternoon, when we saw this warthog looking at us about 80 yards away. We asked Walter to jump off the truck and shoot it, but all he said "You are my substitute. You shoot it" And I did. Dinner time, where every evening we had a full 3 course meal, Soup, main course and dessert. Followed by all sorts of fancy drinks most of the hunters enjoyed. Dwight and his zebra. If you look carefully you will see a gash on his forehead. 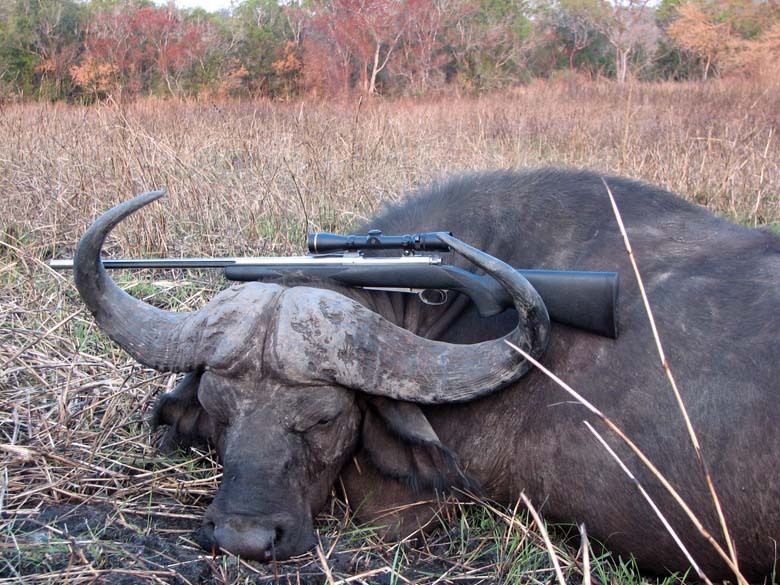 He shot a buffalo, which dropped down and was trying to get up, in his hurry to shoot it again, he crowded the scope, and got himself a nice tattoo! His worst fear was that we will see the photos of this happening - but, the best part is it was all caught on video! The first time we see this. Spots on the balls of a zebra!? A puff adder Roy almost stepped on. 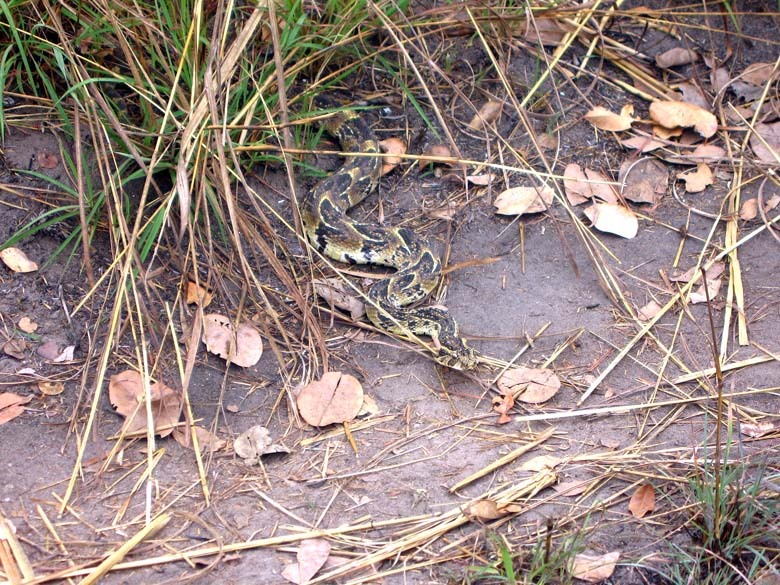 We saw snakes almost every day, and kept wondering how close to them do we get each time we crawl on our hands and knees in the bush. 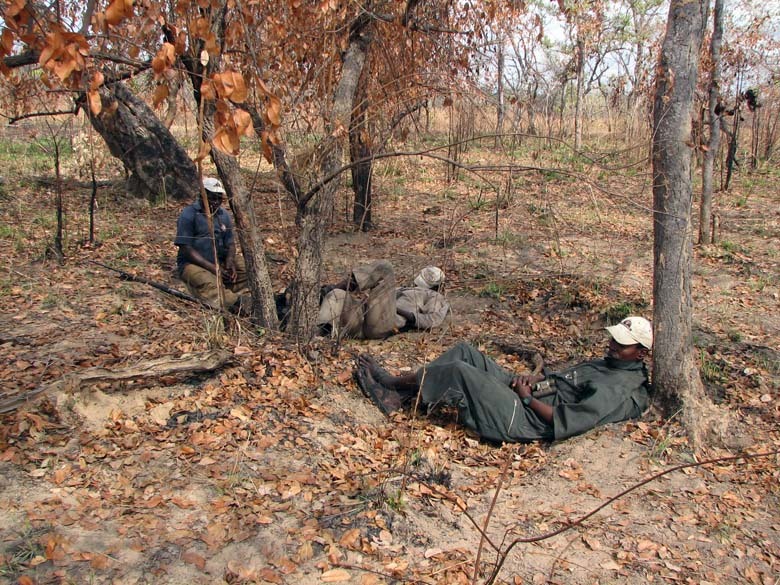 Having a rest after several hours of buffalo tracking. We found the tracks of a herd in the morning and followed them. A couple of hours later we saw them feeding, and tried to get close to see if we could get a shot at one of the bulls. The wind was running parallel to us, but as we got closer, the herd was spread out over a very large area, and we were afraid those on the downwind side might smell us and bolt. Eventually we picked one old bull, but, I decided not to take the shot at he was over 300 yards away, and he was walking away as he came clear for a shot. We left them, went back to camp for lunch, and came back in the afternoon to see if we might have better luck. As we got to about 300 yards from the feeding herd, we saw some eland cows feeding between us. 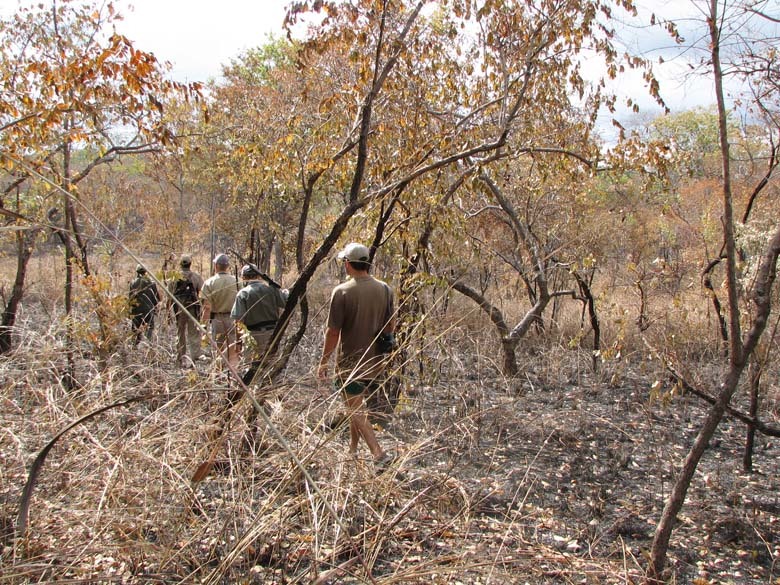 That would have thrown a monkey wrench in the works, so we made a quick retreat, walked further to the left - away from the eland, and resumed our stalk. We could see this bull and another one fighting, but at any given moment, all I could see was only the other one. Roy suggested I shoot this one if he came clear. 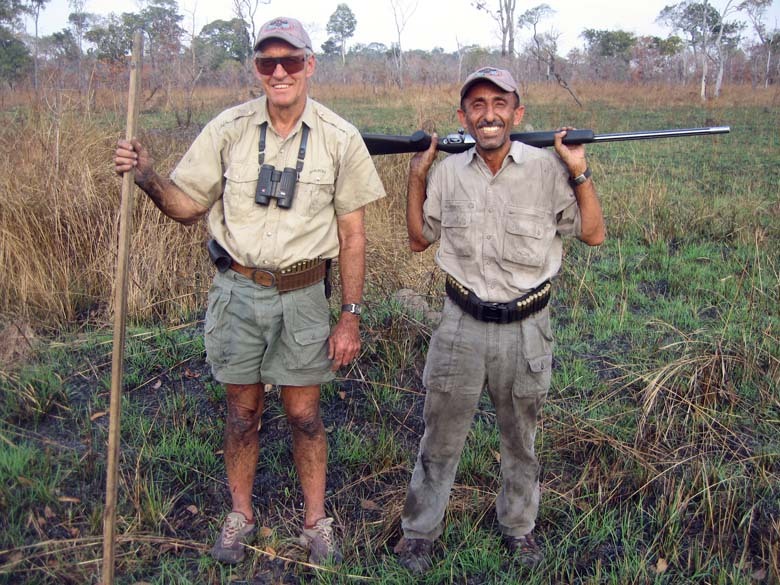 We were sitting on top of an ant hill, and I rested my rifle on Roy's shoulders, and kept an eye on these two. Eventually, this one came clear, and I let him have. He was about 220-240 yards away. He ran off with the herd, and stood as if nothing was wrong with him. As the herd moved further, we could no longer see him. We waited for the herd to leave by its own, and walked up to find this one stone dead. The bullet hit him high in the shoulders, cutting the aorta, and exciting the other side. Stuck in a mud hole. It took us almost an hour to extract ourselves. I bet no one can guess what happened here. 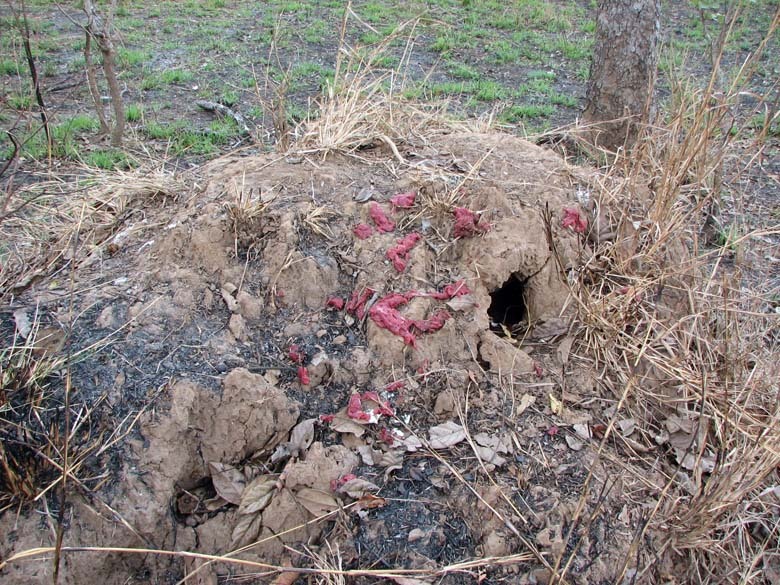 This ant heap was close to one of our lion baits, and somehow the vultures managed to feed on it. 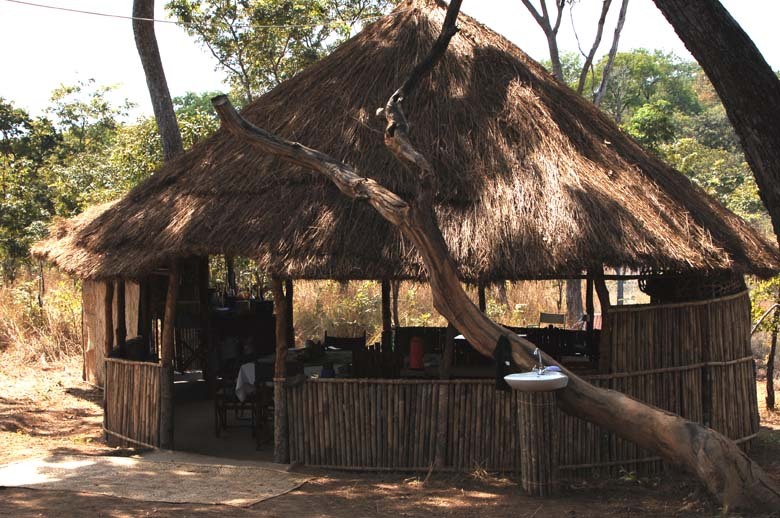 As we came, one of them was sitting on this ant hill after it had gorged itself on our free meat. Trouble was it could not fly in that condition, so it threw up all this meat to be able to take off.